This blanket is finely and tightly woven in black, ivory, variegated deep red/maroon, blue, and very pale lavender against a red ground, with multiple stepped diamonds enclosing serrated diamond motifs. Dates to the last quarter of the 19th Century. Condition: There is are two tiny reweaves in corners. This blanket is in excellent condition. 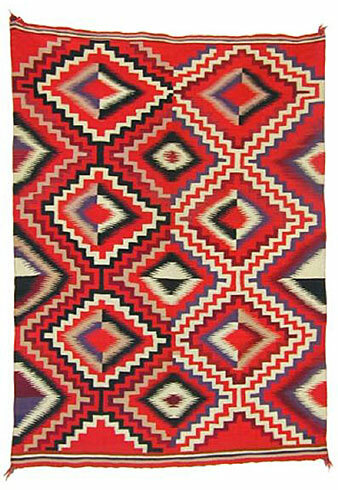 Provenance: This remarkable weaving has an oral history of having been acquired from the Hubbell Trading Post in the late 19th Century. It has been in a museum quality collection in the Pacific Northwest for many years.